Whew! I needed to take a couple days off to catch up from my weekend. It was madness I tell you. Friday afternoon a very fun editor from Virginia put me in touch with another very fun editor from California. They were in a bit of a crazy bind. Well more like a panic really. They needed new rib, chicken, kabob, and pizza recipes with photographs. Oh and maybe a cover if I could swing it. Oh and everything had to be styled specifically so, but not fussy. but was able to give her two extra recipes just in case. I don’t know if you realize this, but when you look at my blog you aren’t looking at food styling. I’m giving you the real deal. My goal here is specifically to make real food, take pictures of that real food we’re actually eating, and not spend much time fussing about it. In other words, this is my place to unwind. On the other hand, when I’m working for a magazine, newspaper or corporation I’m creating a product for their business. Food styling and planning is a must and the creative process is much different than my homey little blog. Admittedly, I thoroughly adore that process. I love to make food beautiful! It’s my art and passion. What typically happens in those types of situations are recipes get planned and tested beforehand and then cooked again in an um, nicer way to photograph. The point is to make us all drool, and to do that food has to be fussed with quite a bit. Sadly, most of that food can’t be enjoyed and ends up in the trash, which makes me feel shameful. Thoughts aside, I can tell I’ve been neglecting my happy place here because I’ve been giving you a lot of dessert and soup recipes. When I toss the meat and potatoes to the side so to speak, it means I’m just sharing the end pieces. I’ll spend some time catching up on a few meals. Hopefully on ones with lots of vegetables. All I’ve got to offer you today is soup, again. Bison soup that I took a quick shot of a couple weeks ago. I hope it’ll be enough for now. enjoying the sun. Soup season might run through July at this point. 1. Toss the shredded cheese with 2 tablespoons flour, set aside. 2. Scrub potatoes and cut into large dice. Cover with water in a large pot, salt well and bring to a boil. When nearly fork tender strain the water and add the potatoes back to the pot. 3. Meanwhile, melt 1 tablespoon butter in a large skillet over medium high. Add the carrots, onions, salt, garlic powder, and onion powder and cook until softened some, about 5 minutes. Add the bison and cook until no longer pink. (If there’s a lot of fat you can strain some out here.) Add 1/4 cup flour and cook for 3 minutes more minutes. Pour the mixture in with the potatoes. 4. Add the chicken broth, beer and parsley and bring the soup to a high simmer for a few minutes. Add the milk and bring back to a simmer, but do not boil for 5 more minutes stirring often. Turn off heat and stir in cheese until melted. Stir in the sour cream and jalapeño juice and season with salt and pepper to taste. 5. Garnish bowls with diced jalapeños and crispy bacon. I have to say even though I think what you do is SO COOL I'm not sure that I could do it. Serious kudos to you! This soup looks delicious. I've never had bison before but with tomatoes, bacon, and jalapenos you can't go wrong! And you ask me how I do it all, lol! The title makes me drool, but what I really want- IS THAT BOWL! I love orange, and you already know the colors of your blog make me smile, and your work of course! This looks great Laura. I'm mostly a vegetarian, but I will occasionally have some meat. I think your blog is beautiful, and I'm glad it is a place where you can "unwind". 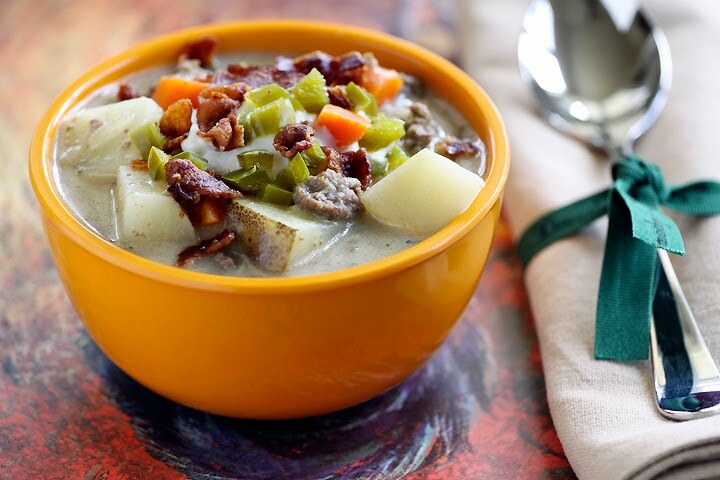 I'm sure we'll have a few more cool, rainy spring days to enjoy soups like this. Gotta love anything with a bit of that jalapeno kick. Girl that's plenty for us! You go with your photo shoots!!!!!! Plus I LOVE bison. Loved reading your post. I do some food styling in Salt Lake and it is a crazy. So nice to work with a photograher, chef and a stylist. That is happiness. I would love to see some of your food styling! How great is that...to get paid for something that you love to do! That's the best! I'm glad we have your blog to admire...your photos here look pretty darn FABULOUS!!! Laura, I've never had bison, but would like to try it sometime. Does it just taste like beef? Sounds like a busy weekend! I haven't done much food styling/photography for clients at this point, but the small amount I have done has been a lot of work. I pretty much post what we're eating throughout the week and I do my best to make it look decent! This soup looks good, too... I haven't had bison before, but I've heard good things. There are people who specialize in that stuff Jen, I just attempt to do so. I kind of know how it all works from school and books, but my major was photography not styling. I just do what you do unless asked otherwise. I've been asked so much lately it makes me wonder if people have stopped hiring real stylists?